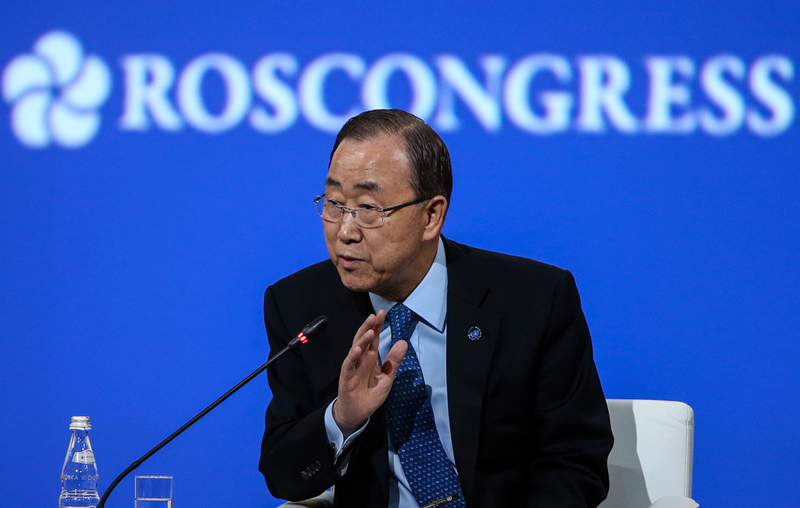 United Nations Secretary General Ban Ki-moon speaks at the opening of the 2016 St. Petersburg International Economic Forum at the ExpoForum Convention and Exhibition Center in St. Petersburg, Russia, June 16, 2016. UN Secretary General Ban Ki-moon has called on Russia and all countries that have signed the Paris Agreement on climate change to promptly ratify the document. "The Paris agreements should be ratified and take effect as soon as possible, by the end of this year, if need be", Ban Ki-moon said at the opening ceremony of the St. Petersburg International Economic Forum (SPIEF). He also thanked Russia for signing the Paris Agreement. Ban Ki-moon said the 55 countries that account for 55 percent of global greenhouse emissions need to reduce these emissions. In this regard, Ban Ki-moon called on the SPIEF participants to assume an obligation to create 'green' economies with low emission levels. Ban Ki-moon called for diversification of the economy, primarily of those countries, including Russia, that are interested in high prices on fuel such as gas and oil.